I have been getting a lot of questions regarding garden pests, particularly flea beetles! I wanted to share a couple of tips to help control these critters. With a little bit of time and persistence, hopefully we can keep our plants, ourselves, and our garden neighbors happy! Tiny “shotgun” holes on leaves of plants, especially tomatoes, peppers, eggplants, potatoes, and early brassicas. Very small black beetles that are very quick and jumpy. Hand squish any beetles that you see and can get your hands on. Place trays of soapy water below your plants and shake them. Many of the beetles should fall off and get stuck in the water. Pyrethrin spray is a common treatment. It should be used sparingly as needed to kill flea beetles. This is an insecticide that should be used carefully, but is acceptable by Organic standards. Spray tops and bottoms of leaves on affected plants. Many people also mix organic biodegradable dish soap with water into a spray bottle. I generally use about 1 tablespoon of soap in a liter spray bottle. This should be applies the same as the pyrethrin sprays. I have also seen a lot of folks use sticky bug traps around their affected plants. These bugs do jump around and move a lot and many of them can be caught in a sticky trap. They are a bit slower in the cool mornings and evenings and can also be caught by hand individually in the sticky traps. Large blotches and tunnels within the leaves, most common on chard, beets, spinach. 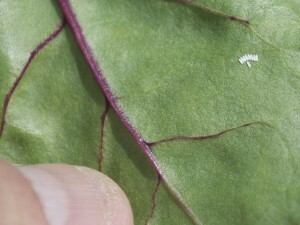 If you inspect the underside of the leaves, you will see linear patterns of small white eggs. Regularly inspect the underside of leaves and squish any eggs that you find. Symptoms: Large, jagged tears and holes in leaves. Common on cabbage, kale, broccoli, and cauliflower. Treatment: Inspect plants for green caterpillars and squish. Catch and kill any white cabbage moths that you can. Symptoms: Curled and Distorted leaves. Commonly found on kale, cabbage, broccoli and the like. You will see clusters of little grey bugs. Treatment: Promote or introduce predatory insects like ladybugs and lacewings that will help to keep the aphids at bay. Spraying a biodegradable soap and water mixture will also suffocate many of the aphids. If you end up with any plants that are totally infested, remove them from the garden completely. Young plants are especially susceptible to being infested, which can lead to severity stunted and unhealthy plants. It is best to address these issues as soon as you become aware, as your plants become more established they will be more resilient to infestation. Have you seen these pests in your garden? Do you have other pests? Let us know what questions you have!